Hernshead, a promontory that juts out into The Lake, is named after what must have once been the shape of a "hern" or heron's head, and a bird often sighted in Central Park. Hernshead is planted with seasonal flowers and aquatic plantings and was restored by the Central park Conservancy in 1988. Hernshead is a miniature woodland landscape overlooking the Lake. Olmsted lavished horticultural attention on this site, first with a grove of London Plane trees and then with a variety of herbaceous plants and shrubs. Hernshead is planted with seasonal flowers and aquatic plantings. Spring is Hernshead's season with blooming azaleas, Virginia bluebells, Dutchman's breeches, and daffodils. Violets add diminutive dots of color amid the unfurling fern fronds. Most striking of all, in late June, is the copse of flowering white Mountain Laurel, a rare sight in Central Park. 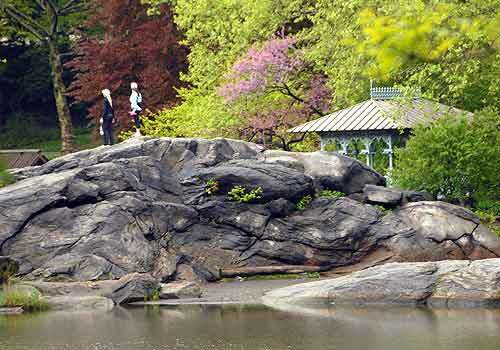 Hernshead was restored by the Central Park Conservancy in 1988. West Side between 75th and 76th Streets.